There were a lot of things I wanted to write before this, but life never goes in the neat little order we desire. I wanted to write about how Grandpa and I would laugh together, the foolish games we would play, and how I would tease him. I wanted to write about the laughter and lightness we made in the midst of the darkness. I wanted to write about the long goodbye. I wanted to write more about the struggle of feeding him, and caring for him, when it was growing increasingly impossible to do either. But that long goodbye has slipped by, and if I have failed to write about the things I have done, at least I have done them. I can write about them another time. Grandpa was becoming too tired to live. I could feed him breakfast, but beyond that point his mind was too exhausted to eat. He didn’t want to eat, he didn’t want to be fed. He just wanted to close his eyes and rest. The fight to throw off the web of confusion was becoming too much, and Grandpa was ready to give up. Thank you for your kind spirit, huge heart and willingness to share with us. Rundy, I only know your Mom through an online gardening community, but I am touched beyond words by what I have read of your blog, particularly your beautiful goodbye. You are an extraordinary young man. Peace to your Grandpa. Such a gift to give…dignity, care, and love… daily. Peace to you and to your Grandpa. He was much loved and has lead a dignified life and in the end, will go in a dignified and loved way. With your grace and kindness. Some times we live out best and most memorable lives just being there for others. Rundy, blessings to you. I bow to your efforts, your courage, your willingness to risk sharing. You show us all the meaning of love. Rundy, My mother lay in the ICU on a breathing machine after suffering a massive stroke. She was essentially dead, but being kept alive. We had talked many times about life and death fortunately, and I knew what she wanted. She was a devout Christian and believed completely that she was going to a better place. I knew she was in peace. What she needed then was my goodbye, to hear my voice and feel my touch before she let go. It was a long trip by air for me and I had a lot of time to prepare myself. Walking in to the ICU where she lay, my younger brother who was mentally disabled waited beside her bed with an older man who helped him a lot. We hugged and shed a few tears. I went to Mother took her hand and said “I am here now Mom. Everything will be all right. You can go now. I love you.” Literally, she let go that minute. The green line went flat and she was officially dead. I cry now still missing her, but I also feel relief that she was ready and unafraid of death. And if there is an afterlife she is at peace. Your essays at times have been uncomfortable to read which of course makes me realize how “uncomfortable” the reality was/is. We readers have no idea what your life has REALLY been like as you cared for your grandfather. Some may say, he’s a young man, he should be living his own life. Well, you have been. 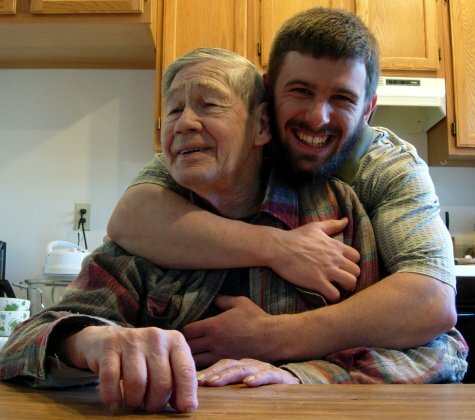 Your choice to care for your grandfather is best illustrated by the picture in today’s essay. The picture makes me wish I could have been with my beloved grandmother semi-paralyzed by a stroke caused by the surgery designed to prevent strokes. Thank you for allowing us to peek into your and your grandfather’s lives and for the example you have shown. What is the status of your grandmother who also lives in the house? Hi Rundy. I am Jill; I work with Lachlan and Teman. I feel like I know you already too, as Lachlan gave me your sites months and months ago; I have followed them. My Grandpa also had this disease; took him in a very different way, however. I wish you peace. You are a remarkable man in a world of so very few. My love and prayers go to you and the whole family. Your Grandpa is so very proud of you – as is everyone. Your mom and I are cousins. I was touched by your writing but almost more by the photo shown above. It’s obvious that you know how to love. Your writing here helps remind me that expressing love like you have been doing shouldn’t be the challenge that we sometimes make it. I found that no matter how much you are prepared for it, the moment that a loved one finally does slip away, it still is a shock and it may come with a flood of conflicting emotions. I’ll pray for you that you’ll have peace at that time. Rundy, your grandfather is blessed to have such a loving and caring grandson. We should all be so lucky. how true..how true…it is what we do and not what we say, isnt it?